By Hillsong Live. Arranged by Michael Ware. Lead Sheet, Set of Parts. 7 pages. Published by MusicWare Press (H0.524125-SC001305294). 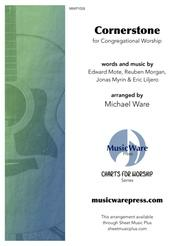 The original recording of so many worship songs is not in the right key for congregational singing in church. If a male artist sang the original, the key is usually too high. If the original featured a female artist, the key is often too low. And worse yet, so many worship songs start low and then jump an octave higher, making congregational participation a challenge. Cornerstone is a song that has some of these problems. 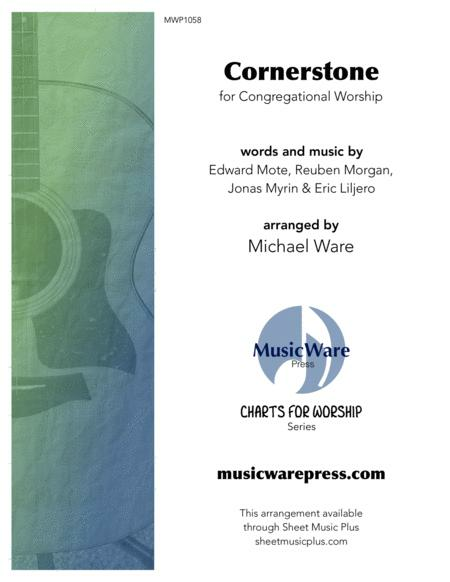 Michael Ware’s arrangement fixes these issues, allowing the average singer in the pew more opportunity to participate. The vocal range of the melody is reduced to less than an octave while preserving the spirit and feel of the original. This download is a collection of leadsheets with melody line, optional harmony, chords and simple musical indications. The key is Eb with two different capo options for acoustic guitar. Help your congregation praise Christ the Cornerstone with this great worship song from HILLSONG.